In order to obtain optimum weld metal in term of chemical composition and mechanical properties, the welding process and weld consumables(wire, rod, flux, electrode, etc) for T91/ P91 steel shall be carefully selected. It is very difficult to find a filler metal to meet the same chemical composition requirements as the base metal while achieve its minimum impact toughness. 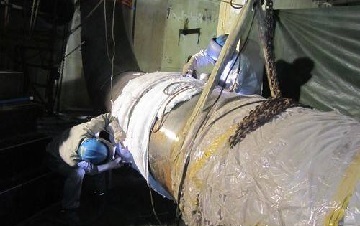 Large-O.D P91 (ASME SA335) pipe welding, SANMEN power plant Unit #1. The content of each element shall be carefully controlled, especially nitrogen (N), manganese (Mn), nickel (Ni) and niobium (Nb). Nitrogen may form carbonitride which influences the creep rupture strength. It may improve both yield and tensile strengths but lower ductility and toughness of T91/ P91 steel. The Ni and Mn can improve the toughness of weld metal. However, the combination of Mn and Ni tends to lower the Ac1 temperature to the point where the PWHT temperature approaches the AC1, possibly causing partial transformation of microstructure of P91 weld metal. Nb has negative influence on the toughness but it improves the creep strength apparently. In conclusion: generally the total content of Mn+Ni shall be less than 1.5%; N content shall be restricted to approx. 0.04%; Nb content shall be slightly higher than 0.04%. * The unit for all values is “%”. *GTAW is also referred to as “TIG Welding” – tungsten inert gas welding.